thanks for the afternoon pick-me-up yogurt run, ctg! my favorite combo is taro and banana-strawberry with fresh banana toppings -- yummy. absolutely delightful. perfect after sush or bbq lunch or dinner at little tokyo. price so reasonable and selection is amazing. don't miss out. 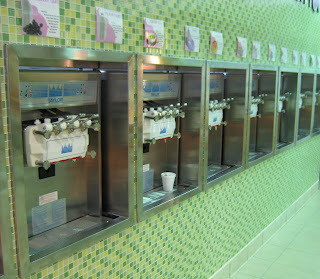 I love Yogurt Land! If you ever go back to Little Tokyo, down the street near Yogurt Land, there's an awesome Japanese restaurant! People were waiting outside to eat there. The food really is good too.